2006-01-01. New. Ships with Tracking Number! INTERNATIONAL WORLDWIDE Shipping available. Buy with confidence, excellent customer service! Weidenfeld & Nicolson. PAPERBACK. 1780228147 Brand new book.Buy with confidence. Money Back Guarantee.Expedite Shipping Available. International shipment available. . New. 2007-08-09. New. Ships with Tracking Number! INTERNATIONAL WORLDWIDE Shipping available. Buy with confidence, excellent customer service! 2015-01-06. New. Ships with Tracking Number! INTERNATIONAL WORLDWIDE Shipping available. Buy with confidence, excellent customer service! 1980-07-10. Good. Ships with Tracking Number! INTERNATIONAL WORLDWIDE Shipping available. May not contain Access Codes or Supplements. May be ex-library. Shipping & Handling by region. Buy with confidence, excellent customer service! Cassell, 2007-04-01. Mass Market Paperback. Used:Good. CORGI CHILDRENS, 1969-01-01. Paperback. Used:Good. London: George Allen & Unwin, 1957 SECOND IMPRESSION of first edition, unclipped DW has a tear from the top of the lower spine fold ( i.e. the rear fold between the spine and the rear panel), this is 60mm long), the very bottom edges of the fold in flaps are insect nibbled, but only losing a few millimetres of paper, no text loss, first work by the author published as fiction, but recounts his real experiences in a 'penal battalion' 297pp + adverts. First Edition. Hard Cover. Very Good/Very Good. Illus. by Arthur Wragg. 8vo - over 7? - 9? tall. 2015-01-06. Good. Ships with Tracking Number! INTERNATIONAL WORLDWIDE Shipping available. May not contain Access Codes or Supplements. May be ex-library. Shipping & Handling by region. Buy with confidence, excellent customer service! Cassell. MASS MARKET PAPERBACK. 0304366315 New Condition. . New. Corgi UK. PAPERBACK. 0552114170 New Condition. . New. London: George Allen & Unwin, 1957. This is the story of one of Hitler's unwilling soldiers, a man of mixed Danish and Austrian descent who, having served a period in a concentration camp for attempting escape from Germany, was transferred to a penal regiment and fought for the Germans throughout the war, mainly on the Russian front. Translated from the Danish. 297pp.. Cloth, Hardcover. Very Good/Good Plus. 220x150mm. New York: Farrar, Straus and Cudahy, 1957. WYSIWYG pricing--no added shipping charge for standard shipping within USA. Translated by Maurice Michael. Green cloth, foil titles on spine, x, 277 pp. Extremities rubbed, surface chip to rear paste-down. DJ browning, moderately rubbed, lightly soiled & spotted, spine fading a bit; in Brodart archival cover. From the DJ: "The Legion of the Damned is presented as a documentary novel, but it is Sven Hassel's own story, 'ninety per cent factual,' he says. It is the ordeal of a man of mixed Danish and Austrian descent who, having served a period in a concentration camp for attempting to escape from Germany, was transferred to one of Hitler's 'penal regiments' and fought with the German army throughout the war, mainly on the Russian front." Shipping weight 2 lbs. (International 1 lb., 12 oz.). First US Edition. . VG/VG. 21½ X 14½ cm. New York: Farrar Straus & Cudahy, 1957. Near Fine/Near Fine. First American edition. slightest bit rubbed at the spine ends, still easily fine in fine dustwrapper. Danish novel about WWII. New York:: Farrar, Straus & Cudahy,, (1957). Near fine in very good dust jacket (chipping to the top edge of the spine of the dust jacket). First US printing. The first book by this controversial writer, described as a "documentary novel" and claiming to be "90% factual", it is the story of a man of mixed Danish and Austrian ancestry who is forced, after an attempted escape from a concentration camp, to serve in one of Hitler's penal regiments on the Russian front. Translated from the Danish by Maurice Michael. While Hassel is perhaps the best selling Danish author of all time (with 50 million copies of his books sold), it has been alleged that he never served on the Eastern front but spent the majority of World War II in occupied Denmark and that he was a member of the HIPO Corps or Hilfspolizei, an auxiliary Danish police force created by the Gestapo, consisting of collaborators, and even that his books were mostly ghostwritten by his wife. 277 pp. The Legion of the Damned. London: Cassell. Excellent condition with only very minor signs of external wear.. London, Cassell, 2004. 11 cm x 17.5 cm. 249 pages. Original softcover. Excellent condition with only very minor signs of external wear. Condition: Excellent condition with only very minor signs of external wear. 2007-08-09. Good. Ships with Tracking Number! INTERNATIONAL WORLDWIDE Shipping available. May not contain Access Codes or Supplements. May be ex-library. Shipping & Handling by region. Buy with confidence, excellent customer service! New York:: Farrar, Straus & Giroux. Cloth. 277 pp, 8vo. Cloth in dj. First edition. Spine ends and corners rubbed/lt bumped, front board lt bowed, crease to spine. Minor soil to textblock, faint offsetting from dj flaps to eps. Interior otherwise clean and crisp. Dj edgeworn w/ nicks/short tear, lt chipping to color overlay of joints, spine sunned, rear panel soiled. Translated from the Danish by Maurice Michael. . Very Good. 1957.. First edition. New York: Farrar, Straus and Cudahy, 1957. Stated First Printing. Hardcover. Very Good+/Very Good+. Stated "First Printing" in clean unclipped original dust jacket. Turquoise cloth boards with stamped silver lettering on spine. No fraying or wear. Binding is tight and square, no cracking. Pages and edges are clean, with clean endpapers. No names, writing or bookplates. translated from the Danish by Maurice Michael. 277 pages. Dust jacket is clean with slight age-toning, short closed edge tears and very slight edge wear. Jacket design by Lawrence Hoffman. Not price clipped. Enclosed in new archival quality removable mylar cover. A documentary war novel -- the ordeal of a man of mixed Danish and Austrian descent who, having served a period in a concentration camp for attempting to escape from Germany, was transferred to one of Hitler's "penal regiments" and fought with the German army throughout the war, mainly on the Russian front. Through its dramatic and brutal experiences pass a group of hardened comrades, thrown together by war, hating their leaders, angry at the fatal insanities in which they are involved. Corgi UK. PAPERBACK. 0552114170 Like New Condition. . Fine. Cassell. MASS MARKET PAPERBACK. 0304366315 Like New Condition. . Fine. Orion Publishing Group, 2014-05-29. Paperback. new. black & white illustrations. Sven Hassel's iconic war novel about the Russian Front. 'An extraordinary book, which has captured the attention of all of Europe' - NEW YORK TIMES'LEGION OF THE DAMNED is an incredible picture of totalitarianism, of stupefying injustice ... He is graphic, at times brilliantly so, but never brutal or bitter. He is, too, a first-rate storyteller' - WASHINGTON POSTConvicted of deserting the German army, Sven Hassel is sent to a penal regiment on the Russian Front. He and his comrades are regarded as expendable, cannon fodder in the battle against the implacable Red Army. Outnumbered and outgunned, they fight their way across the frozen steppe...This iconic anti-war novel is a testament to the atrocities suffered by the lone soldier in the fight for survival.Sven Hassel's unflinching narrative is based on his own experiences in the German Army. He began writing his first novel, LEGION OF THE DAMNED in a prisoner of war camp at the end of the Second World War. London- UK: George Allen & Unwin, 1980. THE LEGION OF THE DAMNED- Sven Hassel- George Allen & Unwin- London-UK 1980- 1st Edition/ 2nd Printing- Hardcover:-8vo- VG++/VG++ dj is nice and bright, slight crinkle now in mylar-spine and textblock are solid, slight spine lean otherwise sound and tight- 297pp all clean, no tears or writing-SEE PHOTOS- "Wonderful jacket illustration by Richard O'Conner. Translated by Maurice Michael. The horrors of fighting in Hitler's penal regiment graphically described in Sven Hassel`s famous book of 1957. Narrative account of barbaric conditions in A front line SS Penal Regiment during WW2. (World War Two North West Europe Military History Axis Germany Third Reich Nazis Penal Regiment. "- Non-fiction-history-WWII-German-Penal Regiment (1761). 1st Edition-2nd Printing. Hard Cover. VG++/VG++. 8vo - over 7¾" - 9¾" tall. Orion Publishing Group. Used - Good. Ships from the UK. Former Library book. Shows some signs of wear, and may have some markings on the inside. 100% Money Back Guarantee. Your purchase also supports literacy charities. George Allen & Unwin, 1980. Book. Very Good +. Cloth Hardback. 1st Edition. 12mo - over 6¾ - 7¾" tall. 1st edition 2nd impression 1980 internally fine & appears unread incl. black cloth boards etc marked down as top edge of text block with slight shelflife - D/j unclipped near fine & protected by clear cello sleeve. Guaranteed posting 24 hrs from St Ives in Cornwall st92. Cassell, 2007-04-01. Mass Market Paperback. Good. Allen & Unwin, 1957. 2nd impression.. Hardcover. VG+. Corner wea/VG. Scuffs, sti. Hassel's first book, a novel of a penal battalion on the Russian front. Allen & Unwin, 1957. Hardcover. Good/Good. 1957. Second Impression. 297 pages. Pictorial dust jacket over black cloth. Previous owner's inscription to front endpaper. Mild tanning to pages throughout with occasional thumb marking present. Light foxing to text block edges. Boards have moderate shelf wear with rubbing and heavy corner bumping. Some light marking to surfaces and crushing at spine ends. Unclipped jacket has light edge wear with minor tears and chipping. Mild rubbing and marking. sunning to spine with crushing at ends. sunning to spine with crushing at ends. London: Allen & Unwin, 1980. 2nd Edition 1st Printing. Hardcover. Near Fine/Near Fine. 8vo - over 7¾ - 9¾" tall. Second edition first printing. Book is tight clean and square. Boards sharp and clean, gilt perfect. Feels lightly read. Minor bump to head and foot of spine, Some light spots to text block edges, near fine condition. Jacket some very minor rubs to spine ends, Light handling marks to the rear, looks really nice in archival cover. Overall near fine. This copy is not ex-lib, not priced clipped and has no inscriptions. For grading accuracy books are photographed without a protective book cover. This book is fitted with a non adhesive archival quality book protector to make a quality addition to your collection. Note we do not use stock images, the book pictured is the book described. A very nice example of this collectible title. London: George Allen & Unwin Ltd., 1957. Hardcover. Corners bent. Tear to cloth at spine. Light shelf wear to boards. Former owner's signature on front endpaper. Otherwise a clean, tight hardcover book in good condition. 297p. A novel about SS troops on the WWII Eastern front. London: George Allen & Unwin Ltd, 1957. HC. good+ w/lightly worn dustjacket (hardcover). 297pp. Weidenfeld & Nicolson. PAPERBACK. 1780228147 Brand New ,Original Book , Direct from Source , Express 5-8 Business days worldwide Delivery. . New. Farrar Straus & Cudahy, 1957. Hardcover. Acceptable. Disclaimer:A readable copy. All pages are intact, and the cover is intact. Pages can include considerable notes-in pen or highlighter-but the notes cannot obscure the text. London: George Allen & Unwin, 1957 SECOND IMPRESSION of first edition, lacks dust jacket, first work by the author published as fiction, but recounts his real experiences in a 'penal battalion' 297pp + adverts. First Edition. Hard Cover. Very Good/No Jacket. Illus. by Arthur Wragg. 8vo - over 7? - 9? tall. 2nd impression 1980. George Allen & Unwin - London. 0048231827. VG+ in VG dustwrapper. .
London: George Allen & Unwin Ltd, 1980. Hardback with dust-wrapper. 297pp. 2nd impression 1980. Edge wear to d/w. A pleasing copy. (bs105). 2nd Impression.. Hard Cover. Very Good/Good. UK: George Allen & Unwin, 1980. 2nd imp. Clean black bds with silver title to spine. 4mm tear to front edge of page197, otherwise Interior VG+. Dustjacket with creasing to top front edge and a little rubbing to some edges. . Hard Cover. Very Good/Good. 8vo - over 7¾" - 9¾" tall. Corgi [0-552-07241-9] 1972, reprint. (Mass market paperback) Near very good, cocked, creases. ... (War Fiction). Seller: Grant Thiessen / BookIT Inc.
George Allen & Unwin, UK, 1957. Hardcover. Good Condition/Good. Second Printing. Size: 8vo Octavo (8 to 9 inches). Binding still very good. Dust Jacket quite chipped and worn. Moderate marks and wear to boards. Now protected in non-adhesive clear wrap. **Contact us BEFORE placing your order. You could save up to 12% of the Book cost. Click Ask Bookseller a Question* ## NON Australian orders requiring tracking, select EXPEDITED shipping at checkout ##. George Allen & Unwin Ltd., 1957. Hardcover. Acceptable. 1957. Second Impression. 297 pages. No dust jacket. This is an ex-Library book. Green cloth with gilt lettering. Ex-library rebind with expected inserts, stamps and inscriptions. Mostly clean pages with light tanning throughout, and foxing to page edges. Cracked hinge and guttering with binding remaining firm. Water drops, rubbing and a few small nicks to text block edges. Tanning along spine and board edges. Forward leaning. Mild rub wear to surfaces and edges with crushing to spine ends and bumps to corners. England: George Allen and Unwin, 1957. Book. Good+. Hardcover. First Edition. 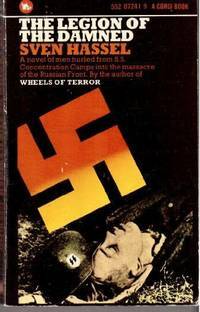 Hassels 1st book later followed by the classic Wheels of Terror. Front free endpaper is marked and dirty, boards marked. A solid copy of this sought novel. Unabridged text with the original character names..
CORGI CHILDRENS, 1969. Paperback. Good. Disclaimer:A copy that has been read, but remains in clean condition. All pages are intact, and the cover is intact. The spine may show signs of wear. Pages can include limited notes and highlighting, and the copy can include previous owner inscriptions. At ThriftBooks, our motto is: Read More, Spend Less.Dust jacket quality is not guaranteed.